Conjugated linoleic acid (CLA) has been widely used as a dietary supplement due to its effects in increasing the use of fat by the body and, in this way, promoting weight loss while maintaining lean mass. Studies show that people who are most deficient in this acid are able to decrease their body fat by taking a CLA supplement. 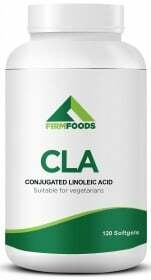 Try CLA from Firm Foods Today! Unlike other weight loss products that act first and foremost as stimulants and consequently accelerate metabolism, CLA can be taken at any time of the day without consequences to your sleep schedule. CLA is an essential part of any weight loss plan. Firm Foods invites you to try a supplement that will help you reach your goal of a leaner and more defined body with less fat and more tone. Lose weight the natural and healthy way with CLA from Firm Foods! CLA help me to loose weigth and maintain it. I been super obese from 105 kilo to 65 kilo with regular exercise and balance diet this products help me a lot. With the price and the quantity in the bottle definitely will buy this again. my second bottle , the best cla in the market. will keep buying with this brand. As a dietary supplement, take 2 softgels with lunch and 2 softgels with dinner. Or as recommended by your doctor or healthcare practitioner. WARNINGS CLA : Do not exceed the recommended daily dosage. Keep out of reach of children. Food supplements should not be used as a substitute for a varied and balanced diet and healthy lifestyle. The product should not be used in case of hypersensitivity or allergy to any of the ingredients of the formulation. Store in a cool, dry place. Please Recycle. BEST BEFORE: Please see lot number and expiration date stamped on the packaging.